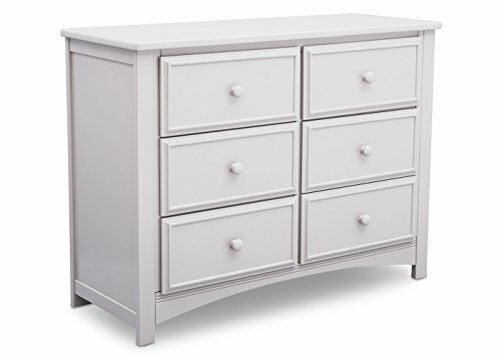 This 6 Double Drawer Dresser from Delta Children is as pretty as it is functional. Featuring spacious drawers with wooden knobs, this strong and sturdy piece will effortlessly store your little one's belongings and last their lifetime. The dresser drawers are easy to use with the ball-bearing, side-mounted drawer guides that glide smoothly. Safety Features: Extra features that ensure your child's wellbeing include safety stops that prevent the drawers from falling out, as well as an included anti-tip kit. Delta Children Safety Standards: All Delta Children dressers meet the requirements of ASTM F2057, the voluntary industry tip over standard for dressers. For your children's safety, only purchase dressers that comply with this standard. For additional security, Delta strongly recommends that all dressers in your home be anchored; all Delta dressers include a wall anchor. To learn how to properly secure your dresser, please see the product assembly instructions or visit our website. If you have any questions about this product by Delta Children, contact us by completing and submitting the form below. If you are looking for a specif part number, please include it with your message.